Have you ever entered a public or company bathroom and been smacked with an odor so repulsive that you fear the sudden, unbidden and unpleasant repeat of your most recent lunch? If you have, you aren’t alone. In fact, poor restroom hygiene got so out of hand in one place that the New York Times recently published an article about the most repugnant public restroom in Manhattan. The thing is, when we say you’re not alone, we say it both because many people stumble upon odorous facilities daily, but also because when you do, in all probability bad restroom odor means you are standing in a room alongside millions of bacterial microbes who are, in their own way, busy with their own private brunches. But where do these little creeps and the residue that often spoils air congregate? What are the causes of these malodors and how can business owners, air freshener distributors or route service operators control them? Read on for an explanation of the five key sources that cause smelly odors in restrooms, a description of our commercial-grade professional hygiene solutions that help ensure any bathroom hygienically clean and a business’ repeat business and bottom line smelling sweeter than ever before, or contact our team today to order any of our products. We recently wrote about the bacteria that lurk in commercial washrooms, but to sum it up, they’re reminiscent of bad house-guests that just won’t leave, no matter how many hints you drop. Scrubbing and mopping may make things look as if they are clean, but traditional mops and rags actually spread more germs around and make the problem worse. Once the mop is dipped back in the bucket, the rest of the cleaning solution is contaminated and any remaining cleaning efforts are ineffective. As long as humidity, warmth and a medium in which to flourish exist, bacteria will continue to thrive and invite all their friends to join them for single-celled orgies on restroom floors and other surfaces. Odor control must be swift, strong, enduring and merciless if any company restroom is to remain fresh and clean. The down and dirty bottom line is a company’s bad smelling restroom is a calling card for negative public perception and certain to affect revenue. Nothing can turn consumers off to any establishment, no matter what they are selling, if their restroom isn’t fresh and clean. The successful annihilation of restroom odor requires that business owners and managers understand the sources of the odors and specifically address them with the proper effective tools, ours of which are the best available anywhere thanks to seven decades of systematic refinements. While the majority of public restroom users do not suffer from real anxiety disorders such as germophobia, this condition is not so far-fetched even among fairly normal mind-sets, when considering that most restrooms aren’t as clean as they may look. This disorder concerns an exaggerated perception of germ monsters lying in wait in restrooms like hungry alligators in a leafy glide, waiting for the right moment to creep, crawl and permeate the pores and crevices in floors, vents, door handles, toilets and walls for the sole purpose of attacking humans. However distorted from reality this phobia may be, the idea that bathroom bacteria are invisible, ubiquitous and very difficult to kill even with 007 repellants autographed by Sean Connery, is true. What Are The Five Main Sources of Restroom Smells? Perhaps not the most appetizing subject for even a serious conversation, the five main sources of restroom odors are (no drum roll, please): urine, floor drain dysfunction, floor grout, burst pipes and defective wax rings around toilets. Some solutions for these odors require the services of plumbers, while others can be made to disappear with the help of Air Scent and their cutting edge odor control and management strategies and air freshening solutions. The most common source of bathroom odor is urine, and specifically the first u-bend trap part of the urinal trap. The warm, acidic fluid is an excellent food source for odor-causing bacteria, and as they multiply, so does the intensity of the odor. The urine undergoes a chemical process, which alters it from an acid to an alkaline salt. This attracts more moisture, creating a comfortable love nest for bacterial growth. The more the bacteria feed and breed, the worse the odor gets. To compound the problem, large puddles are not the issue. Most urine malodors in restrooms emanate from spills on the floor. Tiny droplets, which are released into the air every time a toilet is flushed and floor traffic from shoes and backpacks can spread these droplets by sliding over affected surfaces. Due to the fact that urine is a waste product produced in the kidneys that filters out harmful elements, it can also contain various salts, proteins, carbohydrates, fatty acids, trace amounts of hormones, proteins, carbohydrates and urea, which contains nitrogen. Bacteria feed upon the urea, protein and carbohydrates and create other byproducts, such as hydrogen sulfide and various ammonia compounds, which are offensive to our nostrils. All of this leads to the absolute need for frequent cleaning of urinal traps on a regular basis. Not doing so allows build up and the consequent odors that ensue. That dark abyss known as the floor drain is one of those things that most people don’t even notice, but it can be another source for restroom odor. They are often found in commercial restrooms and industrial spaces, near and around water heaters, basements, kitchens, and/or laundry rooms. Especially designed with a trap to retain water at all times, if the water in the drain trap beneath the floor dries out, sewer gas can vent upwards and escape, causing foul bathroom odors. This can prove to be dangerous as well as malodorous because sewer gas contains methane, which can be explosive. Bacteria, mold, mildew and other pollutants absorbed into the floor are the primary cause of grout odor. Due to the fact that grout is porous and difficult to clean, bacteria can easily thrive. Mopping can actually worsen the situation because the average mop cannot penetrate the grout’s rough and porous surface to remove impurities. Often, the grooves between the tile and grout can even draw contaminants out of the mop and transfer them into the grout’s pores. Floors endure the most traffic in any home. In a recent study at the University of Arizona, researchers found that in 90% of instances, bacteria picked up from shoes transfer to the tile bathroom floors in a house. These bacteria can cause stomach, eye and lung infections. The study also indicated that bacteria live longer on our shoes than in other places. Restroom malodors often emanate from cracks in the floor tiles. The odor does not come from the tiles themselves but rather from a buildup of urine droplets over time. A burst pipe in any bathroom requires the services of a professional plumber. Bad odor indicates that sewage is not being successfully transported from the pipes to the municipal sewer lines. This usually indicates a backup of sewer gas, which is a complex blend of both toxic and harmless gasses, which can include hydrogen sulfide, ammonia, methane, esters, carbon monoxide, sulfur dioxide and nitrogen oxides. These compounds are the natural result of the decomposition of organic household or industrial wastes. These sewer gases can be concerning due to their odor, health hazards and volatile potential to create fires or explosions. Offensive bathroom odors that many describe as resembling rotten eggs can result from the defective wax ring found at the base of the toilet. These foul smells can also be unsanitary as they usually contain toxic pathogens such as to hydrogen sulfide, which is a chemical that can irritate the eyes, cause a cough or sore throat, shortness of breath, and fluid accumulation in the lungs. The ring seals the toilet to the waste pipe below it. During installation, this ring is tightly crammed down in order to create an airtight seal between the underside of the toilet and the top of the rim on the drainpipe. As long as the toilet is fixed to the floor, the wax will remain intact and the seal effective. But if, for whatever reason, the bolts holding the toilet to the floor corrode and break, or even if they loosen, the toilet may rock from side to side, ruining the seal on the wax ring and releasing foul-smelling odors. Whether a restroom odor is particular or generalized, odor air fresheners will only mask the problem and what is really needed is an odor neutralizer/eliminator. This is especially the case when it comes to urinal traps, which need thoroughly cleaned by hand on a regular basis. Our air-care experts can provide the proper solutions with a host of choices adapted specifically to the source of the malodors. With its modern design, ingenious nesting refill tray features and three smart switch settings, the AromaOne dispenser is the first and most important tool in the arsenal to control airborne malodors. 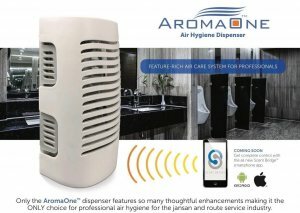 Only the AromaOne features so many thoughtful enhancements making it the premier choice for professional air hygiene and route service industry. The innovative and versatile design of these self-locking Fresh Straps allows for placement anywhere in a commercial restroom, including under sinks and partitions. They are infused with fragrance and powerful enough to freshen the air around portable toilets and commercial restrooms for up to 60 days. They can be used with the Wizzard urinal screens and other Air Scent refills for maximum effect. Our Wizzard urinal screens are very effective in busy company bathrooms for two reasons. First, they contain ten times the aroma of most screens on the market today, and secondly, they work continuously for up to 60 days. Wizard screens are known for their translucent colors that not only fit in to any bathroom décor, but also are specially designed to reduce splash back and provide superior fragrance and odor control at the same time. There is no more effective odor neutralizer on the market today than our Metazene additive. This spray annihilates the particles that cause foul malodors at the molecular level. When push comes to shove, other odor neutralizers only mask odors such as mildew, mold, urine and trash, while this highly potent neutralizer eliminates them forever. This spray is designed for use on splash panel dividers, walls and areas where urine and uric acid salt have been deposited (urinals). It must never be applied directly to toilet seats or other points of human contact. Available in quart-sized sprayer in Cherry or Floral scents, this spray works best when used with Air Scent fan fresheners and/or drip appliance dispensers. This one drip automatic, non-battery operated dispenser cleans and deodorizes bathroom fixtures and freshens the air. This dispenser is shipped with a 16-month supply (one quart) of Westchester® “dilutable” drip fluid concentrate and 15 extra wicks. Air-Scent® International’s innovative MegaFresh™ Modular Diffuser System completely destroys airborne malodors with the help of the Metazene® additive. Highly effective and easy to use, it operates continuously for 30-60 days and is, without a doubt, the most potent and enduring odor control system ever invented. This system is perfect for neutralizing foul odors found in hallways, under bathroom sinks in large stadium washrooms, stairwells, elevator shafts and trash rooms. Our dry vapor scent-diffusing system is ideal for really large bathrooms you might find in casinos or stadiums and freshens air and controls odors for interior spaces of up to 50,000 cubic feet. It offers two innovative 30-day refill systems; the Aroma Beam cartridge and the Aroma Beam Squair. 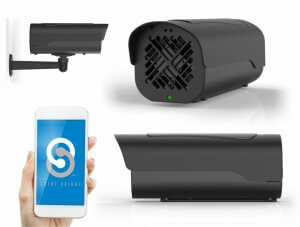 Its multiple mounting options, compact size, heavy duty polymer constructed housing and solid state circuitry for adjustable output among other numerous features makes the Aroma Beam the best large room air freshener on the market today. If you own or operate a business facility, or you’re an air freshener distributor or route service operator, contact our team today for a sweeter smelling tomorrow.